Yup, it is that time of year again. So far, Palmyra managed to survive Hurricane Sandy. To tell the truth, we were hardly impacted by Sandy. A few people had trees fall over, but we have that every year. Things were no worse here than usual. As to snow, watch this page to find out when it snows and for pictures of it. Day 1 – December 1st, 2012 – Woke to a slight dusting of snow. Yes, it stuck. Was it measurable? If it was, it was about 1/8th of an inch. December 4th, 2012 – 62 degrees today! I measured 6″. That’s a lot for here, and especially for the season’s first snow. We’re supposed to get snow through tomorrow. Day 3 – December 23rd, 2012 – Just a light dusting over night, and nothing additional during the day. The snow has melted a bit, but then the temperatures dropped and we’ve now got some pretty icicles. Day 5 – December 26th, 2012 – It started to snow this evening. We came out of the movie around 5pm, and it had been snowing for a while, but nothing really measurable. By the time we got home, it was starting to pile up. I went out around 7pm to check on a heater at our commercial building, and it was about 2 inches already. Day 6 – December 27th, 2012 – For the first time since living here, there was snow at the base of our “snow window”. (This is a window near the ceiling of our bedroom that, when laying in bed, you can watch the snow fall.) I went out to shovel the walk and back driveway with the help of our roomer, and it was 12.5″ deep. Between the two of us, we got the driveway shoveled in the back so he could get his car out. I started on the front driveway, but by 11am, it was coming down hard again, so I stopped. Snow piled up against the studio front door. Day 7 – December 29th, 2012 – We must have got another 4 inches today. Day 8 – January 1st, 2013 – Happy New Year and it is snowing. Big flakes are coming down. We had some melt Sunday and yesterday, but now we’re getting some replenishment. They say we are only going to get flurries and snow showers. Day 9 – January 6th, 2013 – Just a dusting of snow today. January 9th, 2013 – update. It has been warming up and all that snow is melting. All day long I would hear crashing sounds like someone kicking a trash can. It was chunks of snow and ice falling off people’s roofs and hitting stuff below. They say by the weekend it might get to 60. Day 10 – January 17th, 2013 – Just a light dusting (see my blog for 1/18/2013) until about 10pm, and then it really came down for a while. Day 11 – January 18th, 2013 – I got up to use the bathroom about 4:30am and it was still snowing, and when I got out of bed this morning, there was about 1/2 inch sticking to the ground. Day 12 – January 21st, 2013 – 1/10th of an inch today. Whoa! Day 13 – January 23rd, 2013 – 1/3rd of an inch today. I’m in Georgia, so I missed it. Day 14 – January 24th, 2013 – 2.6 inches. Well, I’m in Texas so I can’t shovel it. Day 15 – January 25th, 2013 – 1/2 inch today. Day 16 – January 27th, 2013 – Another 1/10th of an inch day. We’re back home. Day 17 – January 28th, 2013 – Work to about 1/4 inch of snow, and it was snowing, but turned to rain. Day 18 – January 31st, 2013 – Nothing stuck the the ground, and most of it was moving sideways because of the windows. Yesterday, 1/30/2013, it was in the mid 60s, and today it is in the mid 20s. Now I know what the scripture means when it says in the latter-days the earth will toss too and fro like a drunken man. Day 19 – February 1st, 2013 – Woke to a blanket of a 1/4″ on the ground. It’s still coming down. UPDATE: 9:30am. I’ve been up for about 2 1/2 hours and the last hour we got about 1.5 inches of snow. Day 21 – February 5th, 2013 – A little more than yesterday, but not much. Day 22 – February 6th, 2013 – Another dusting. This time, it looked like it was going to get worse, but by noon, it had all stopped and the sun came out. These last few days of light dusting of snow have made for some beautiful sights as you can see from these photographs. Day 23 – February 8th, 2013 – The big storm hit us today. It all started around noon when we started getting about 1″ per hour for a while. By 8pm, there was about 8″ on the ground. Day 24 – February 9th, 2013 – The big storm continues. When I got up, I measured the depth at 10″. It only snowed about 1/4″ more during the day. On Sunday, February 10th, 2013, the sunshine came out in the morning and Palmyra was transformed in to this beautiful winter wonder land. The next day, Monday, we woke to rain and it was all melted away. Day 25 – February 11th, 2013, a light dusting this morning. Day 26 – February 17th, 2013, we woke to about 1.5″. I got it shoveled before we left for church. Day 27 – February 18th, 2013, just a slight dusting this morning. Day 28 – February 20th, 2013, another light dusting of “ice”. It really wasn’t snow on the sidewalk, but small ice crystals. Day 29 – February 21st, 2013, we got a little less than an inch. The temperatures are in the teens, so the snow is very dry, and it is very icy. Day 31 – February 27th, 2013 – Wet and slush snow. Day 32 – February 28th, 2013 – More wet snow, but not as much as yesterday. Day 33 – March 1st, 2013 – It started snowing early today. It looks like it is falling out of a sifter. Day 34 – March 2nd, 2013 – a little bit of a dusting again today. Day 35 – March 3rd, 2013 – and, a little more. Day 36 – March 13th, 2013 – The day started out nice and warm, and around noon it turned in to windy and snowy. Day 37 – March 14th, 2013 – The snow from yesterday continues. Nothing is really adding up. It’s about 33 degrees outside, and the snow is somewhat sticking, but it isn’t going to last. Day 38 – March 15th, 2013 – It started snowing again. It’s too early to know how much we’ll get, but I think it is going to be like yesterday’s snow. Day 39 – March 18th, 2013 – We almost made it through the day without snow. Then, somewhere around 6pm, it snowed. We got about an inch and then it stopped. Day 40 – March 22nd, 2013 – It’s snowing. We’ve got about 1/2 inch right now (8:15am), and big flakes are still falling. Here it is spring, and we’re still getting snow. If you want to see what the past few years have brought, visit my other Season Watch pages. Day 41 – April 2nd, 2013 – I couldn’t believe that we had a blanket of snow this morning. It’s only about 1/3rd of an inch, and it isn’t sticking to the black top, but the grass and dirt are covered. The news is saying this will be the last storm of the season. We shall see. I’m so happy to discover your blog and your “season-watch”. 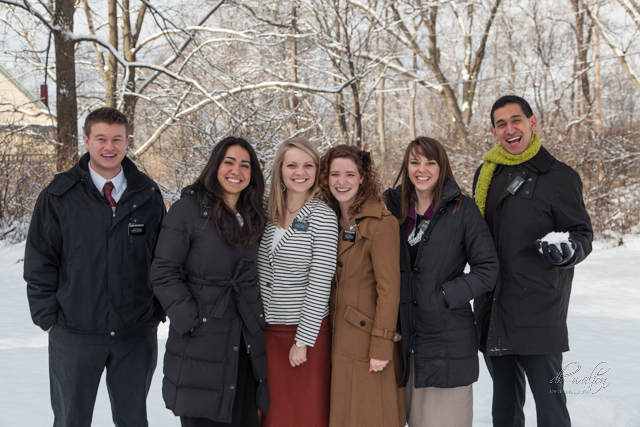 We’re moving from N. California to your stake later this spring and your account of the winter is a great introduction for my children who have never lived in a true winter climate. We’re so excited! The pictures are beautiful–keep us updated!